A character in Udaan (“Flight”) says that fathers always want their sons to grow into men just like themselves. When the father is an abusive alcoholic, he’d better hope his wish doesn’t come true. Someday, his son will be bigger and stronger than him. 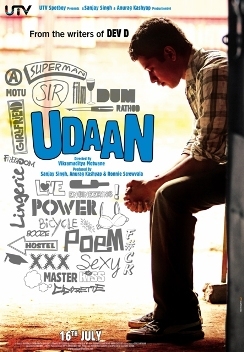 Udaan‘s protagonist is Sir’s 17-year-old son, Rohan (Rajat Barmecha). He’s a smart kid and a gifted writer, but a poor student. He takes reckless chances despite knowing the consequences. He’s expelled from boarding school when he and three friends sneak off campus to watch dirty movies. His friends return to their wealthy families in Mumbai, while Rohan returns to the industrial town Jamshedpur and the father he hasn’t seen in the eight years since Rohan’s mother’s death. Rohan finds a six-year-old boy living in his childhood bedroom, the product of a second marriage that his father said “didn’t work out” and that he didn’t bother to tell Rohan about. The half-brother, Arjun (the impossibly cute Aayan Boradia), already mimics their father’s verbal abuse but casually mentions that Sir hits him sometimes. Sir refuses to entertain the possibility of Rohan becoming a professional writer and puts his eldest son to work in the factory he owns. Rohan attends engineering college in the afternoon, with the expectation that he will one day inherit the factory. At night, Rohan acts out, taking the family car on joyrides to drink and smoke at a local bar. Rohan is shaken from his drudgery when Arjun winds up in the hospital. Sir claims the boy fell down the stairs, but Rohan suspects child abuse. Sir leaves town for a few days, giving the brothers time to bond. Rohan entertains Arjun and other people in the hospital ward with his original stories until his father returns, once again crushing his Rohan’s chances for happiness. Udaan is the rare movie that actually justifies a runtime of more than two hours. The plot unfolds at a pace appropriate for its teen protagonist. He’s in an impossible situation: he can’t live his own life under his father’s rule, but he has no adult to turn to for guidance. His uncle, while compassionate, is himself subject to Sir’s abuse. When I wanted to scream, “Just run away!” I had to remind myself that Rohan is supposed to be a real teenager, not some cinematic creation wise beyond his years. The movie also strives for realism in the relationship between father and son. A lesser movie would aim for a sentimental conclusion espousing the belief that there’s good inside everyone. Sir is a jerk, and Rohan himself is far from perfect. The movie is more about protecting what you love, be it a dream or a vulnerable sibling. Udaan isn’t about redemption. It’s about self-respect. This entry was posted in Reviews and tagged 2010, 4 Stars, Aayan Boradia, Bollywood, Flight, Hindi, Indian, Movie Review, Rajat Barmecha, Rohit Roy, Runtime, Udaan on November 16, 2010 by Kathy. Just out of curiosity which other movies you have rated 4 out 4 ? Besides Udaan, I’ve written 4-star reviews for the following movies: The Japanese Wife; Dil Chahta Hai; Ishqiya; Road, Movie; Yuva; Dil Se; Striker; 3 Idiots; Love Aaj Kal; DDLJ; Bachna Ae Haseeno. I don’t have published reviews for these movies, but I consider them worthy of 4 stars as well: Chak De India; Rang De Basanti; Swades; Pinjar; Lagaan. Thanks for asking, Raj. Watched the film on TV. I know that it has been 6years since the movie released, but i bet that this is the biggest success and will be of india after AB and Rajkumar Hyrani films. Ronit Roy! Oh Ronit Roy!!! What a fine artist is he. His eyes speak a 100magical words. I had watched a many tv shows of him and had an idea that this man would definitely shine. A man who played the character of #KD in the popular tv show #Adaalat, a positive perfect lawyer, how could he manage to be such an evil…… He is fab!!!! !